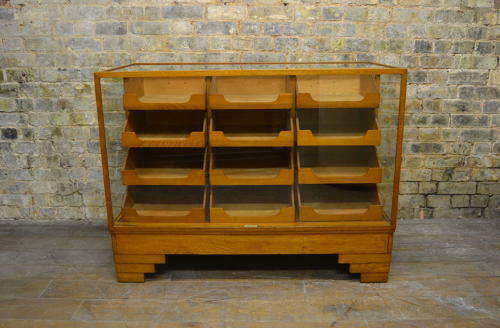 This is a beautiful 1930s haberdashery drapers cabinet with 12 drawers - it's a very hard to find size and would fit into a range of shops. Made by Dudley & Co of Holloway, and has stepped Art Deco feet. It's a fully restored item with new toughened glass. We have similar cabinets available - 180cm in width. We do have versions in restored or original condition.